We believe that full customization is the only key to deliver best-in-class Android Wear Smartwatch apps. Over the past decade, Consumers, Small & Medium Businesses are leveraging from millions of android apps. However, the trend is now shifting to the smart wearable. More and more businesses pertaining to the different sectors are now getting into the android wear apps development to expand their global reach. With the team of seasoned & top wearable app developers, our team is well-known for designing & developing highly scalable apps that not only suits your business but also triggers target audience via impeccable UI. Being a leading wear app development company, the android wear apps designed by us utilises a wide range of sensors and instruments built into wearable devices. with End-to-End Android Wear app development services. 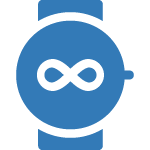 Android Watch App Development is a simple yet complex field that not many App Development Companies are capable of understanding to its fullest extent. At Moon Technolabs, we do not rest until every technology in the Software and App Development field is understood and mastered by us. Combining our thirst for knowledge with keen eyes for design and development; is what you get from a company that consistently produces high-quality premium apps & products for a very niche clientele. We craft our esoteric logical approach pertaining to the customized & personalized need requested by our valuable clients. Keeping top-notch quality parameters for years has turned into a habit now and hence, we absolutely like to lend our ears to shape your business plan/idea into reality apps that offer exceedingly well usability and great potential for your business processes. You can expect fully integrated and innovative Android Wear app development proposals from Moon Technolabs. Our attention is to encapsulate on the various & feature-rich Android Wear platform to exponentially expand your presence to global targeted market and respective industry audience.